Private taxi: As a visitor to the beautiful and historic Amsterdam, you may feel a little overwhelmed by the vast number of sights and attractions. A comfortable, chauffeured taxi with a private driver is the ideal way to explore the city and beyond, safe in the hands of your professional driver. Suitable for families, couples and small groups, your English speaking chauffeur will be happy to answer all your questions. 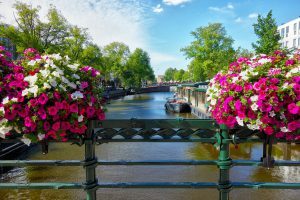 If you have your heart set on specific attractions or historical sights in Amsterdam or throughout the Netherlands, a customized tour is a perfect option. The tour package will include water, snacks, parking and V.A.T. to ensure your peace of mind that, other than entry fees, all costs are accounted for. Top of most visitor’s lists during the spring season is a trip to The Keukenhof, a vast area of flower and tulip gardens, covering over 79 acres. With over 7 million bulbs planted annually, it is renowned as one of the world’s most extensive flower gardens. Although accessible by public transport, a private taxi will take you straight there with your experienced driver having an insider’s guide on what to see. When you wish to escape the delights of the city,a private taxi can take you to the North of Amsterdam to see the iconic windmills. The Dutch landscape is crisscrossed by dams and ditches, dotted with traditional towns and villages including Volendam and Marken. Your knowledgeable driver will help you explore the windmills, wooden shoe workshops and authentic narrow streets. Art and history lovers will not want to miss a visit to the Mauritshuis, situated next to the house of parliament in The Hague. This intimate museum is home to some incredible Dutch masterpieces, including “Girl With A Pearl Earring” by Vermeer. A private taxi will deliver you to this seventeenth-century monument, before taking you in comfort to the popular tourist attraction of Madurodam. Taxi Amsterdam 24 we recommend if you are interested in Sightseeing by private Taxi. You can read all about their services here.